The eerie deserted back streets of Paris presented an opportunity on this evening. Long past sunset, I wandered among residential neighborhoods towards the roaring sounds of traffic in the distance. 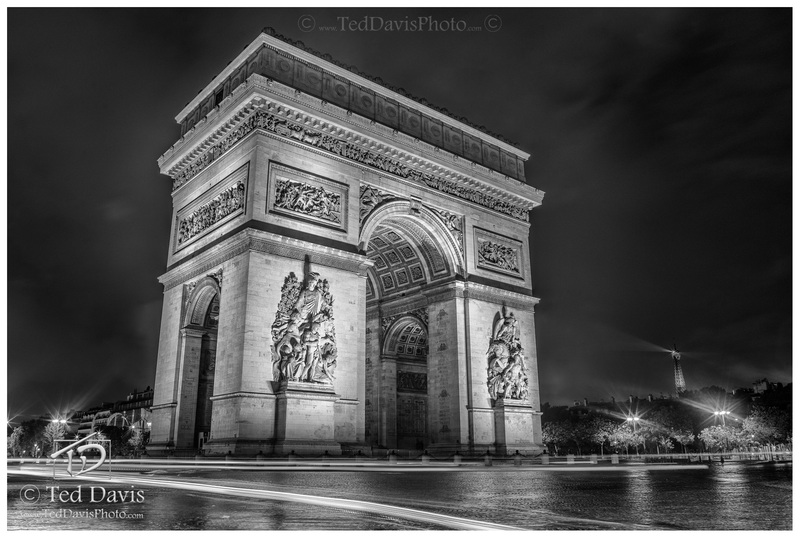 With rain trickling down from the gutters in the aftermath of a short evening storm, I came upon Les Champs-Elysees. In front of me stood the Arc de Triomphe, a proud monument to France, forever etched with the fallen of the Revolution and Napoleonic wars. Setting up my shot to capture this magnificent memorial, the rain again began to fall. I knew in that instant I needed the timeless quality of a black and white long exposure to truly capture the essence of the scene before me. I pushed down the shutter and captured Napoleon’s Triumphal Arch. Photo © copyright by Ted Davis.